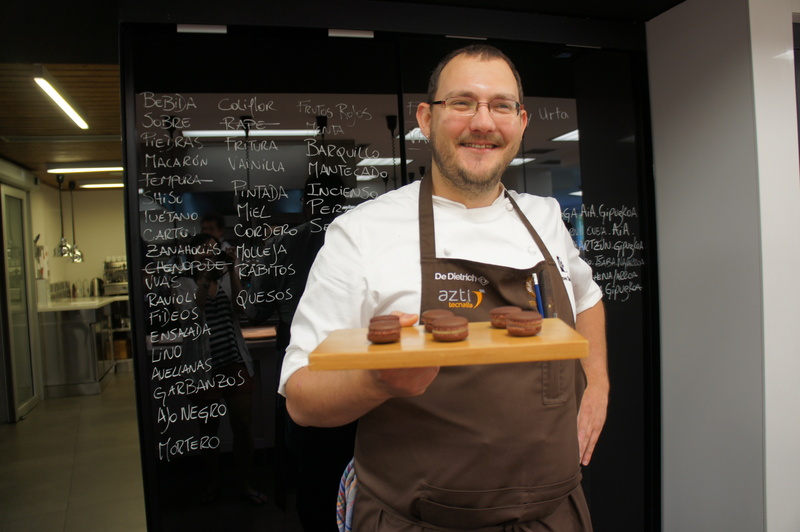 Dining at the #3 Restaurant in the World: Mugaritz, San Sebastian | 15,000kms of Food! 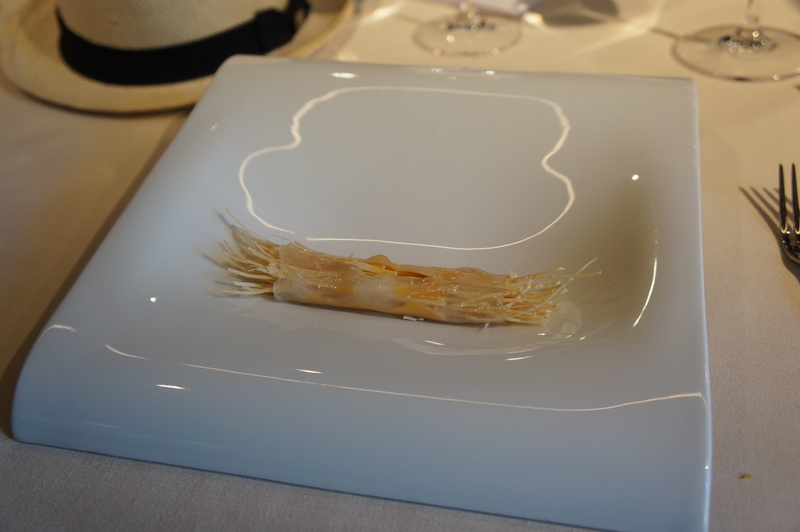 We were in San Sebastian in September 2012 and paid a visit to the #3 restaurant in the world, Mugaritz . 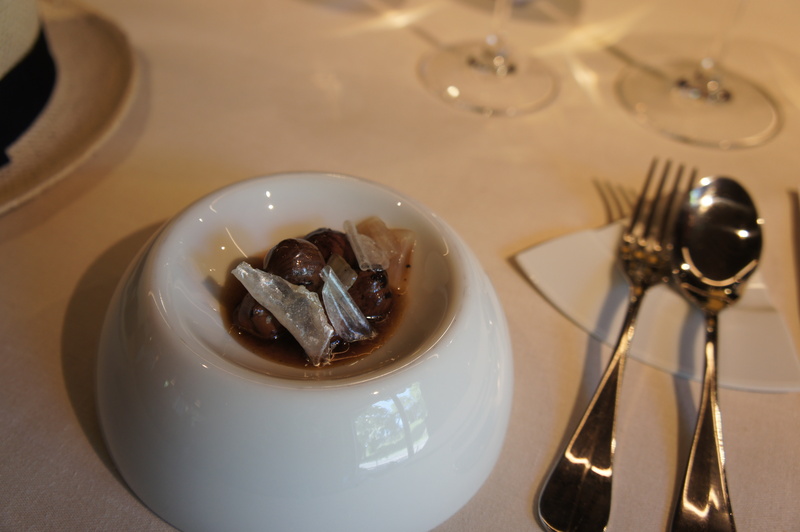 The restaurant is a short drive out of San Sebastian, and as the party got into the cabs and headed up the hills, were heady with anticipation. The scenery around the restaurant is breathtaking – rolling hills, lush greenery and fresh oaky air. From the outside, the restaurant looks like a homely cottage but once you get inside, it’s bare minimalist modern furniture (but still very woody looking). We were greeted by the wait staff and whisked away to a tour of the facilities and kitchen. They showed us the working kitchen and gave us the spiel about the creative labs where they invent dishes. 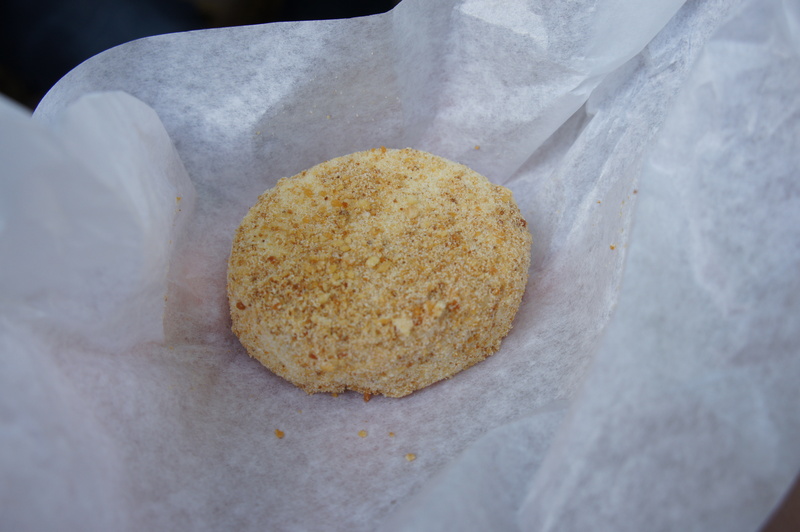 We were then presented with macaroons that had a secret ingredient – blood! If they didn’t tell me there was blood in there, I still would have picked it. It had that metallic taste but was strangely sweet. 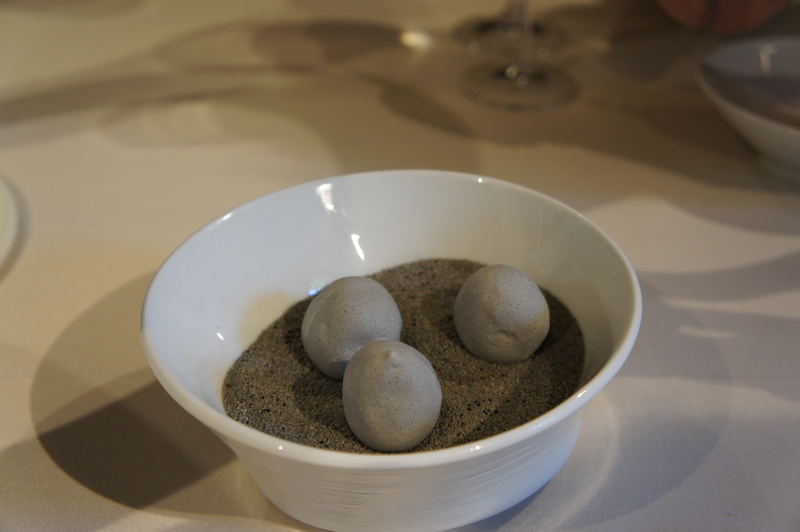 First dish up was described as “edible stones” which was basically roasted potatoes covered in some sort of edible ash. It tasted like an extreme potato (which works for me as I love potatoes!). 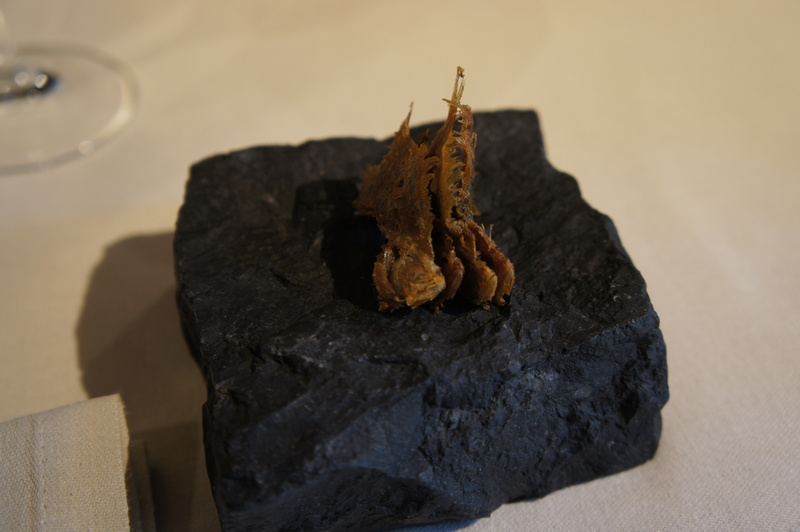 ““Fishbones” with nuances of lemon, garlic and cayenne pepper” was an interesting dish – dried fish and bones which were crispy and salty. We were served a mouthful but I could have had bowls of this stuff. Would have worked wonders with beer. 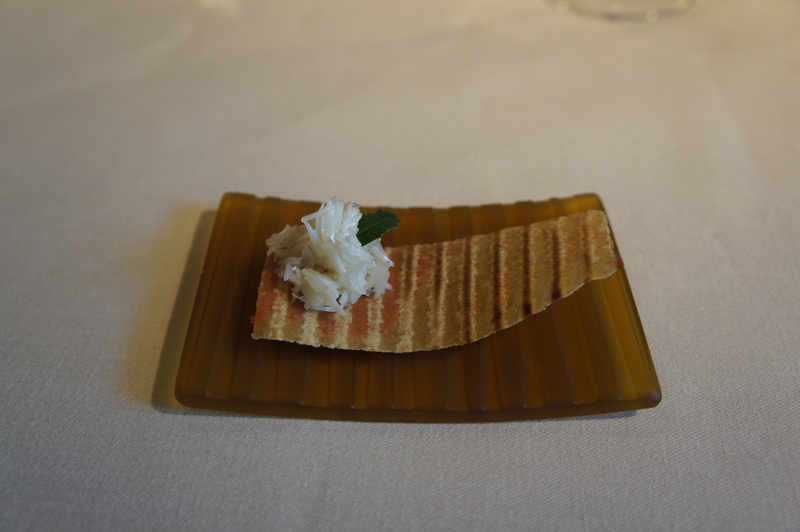 The “flax and wheat “Kraft” paper with marine accents” was interesting – it really did taste like a sweetened sea. Texturally interesting as well with the brittle paper. 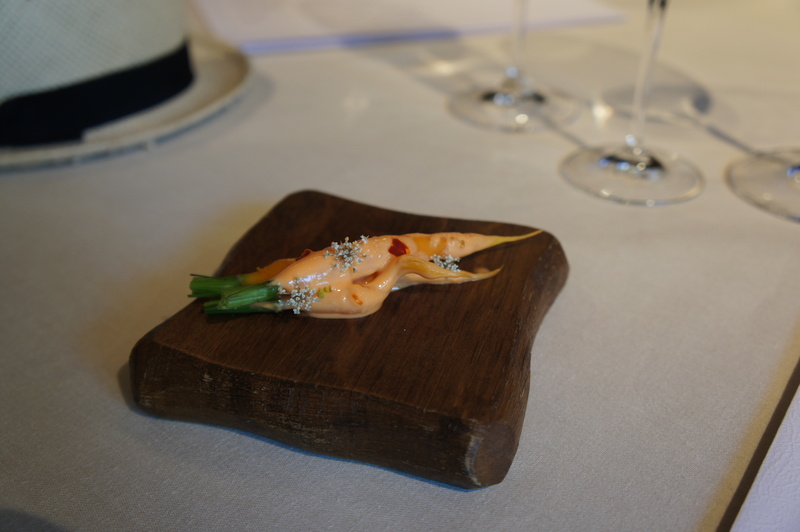 “Carrots and their smeared flowers” was as described – delicious perfectly cooked carrots with a carrot sauce. Also pretty as a picture. 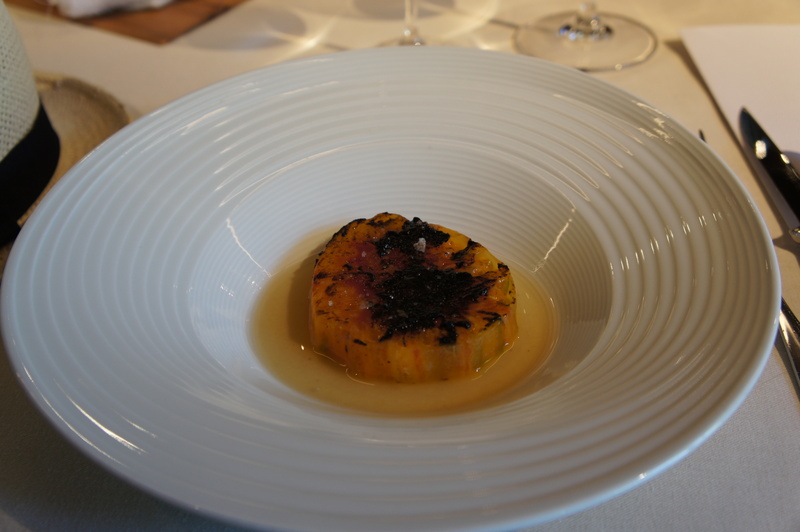 The “tomato and sweet garlic” rocked my world… the tomato was sweet and light and the black garlic was crunchy. Both worked wonderfully with each other. The “tagliatelle of concentrated milk lightly soaked in a silky juice of roasted squash and tomato” really tested my taste buds. It was really subtle but the textures was the surprising element. The wrap was sticky and the tagliatelle was crispy and there was a creamy sweet sauce with it. 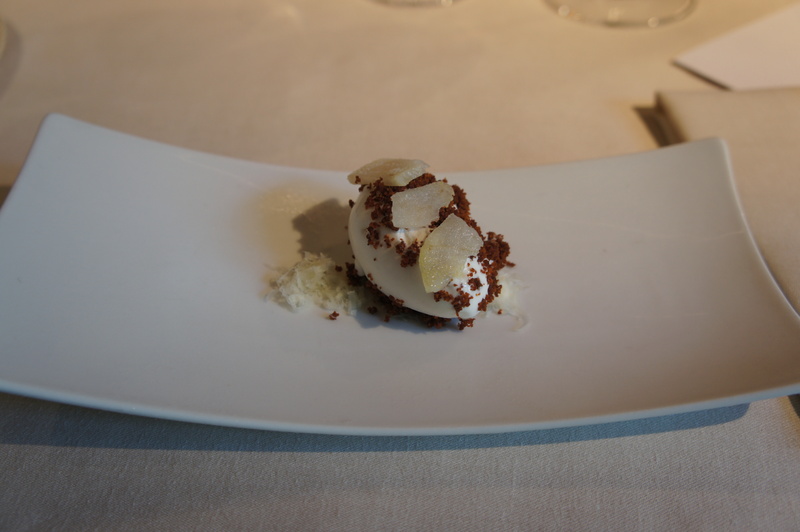 The next dish that came out was the “cremed legumes”. 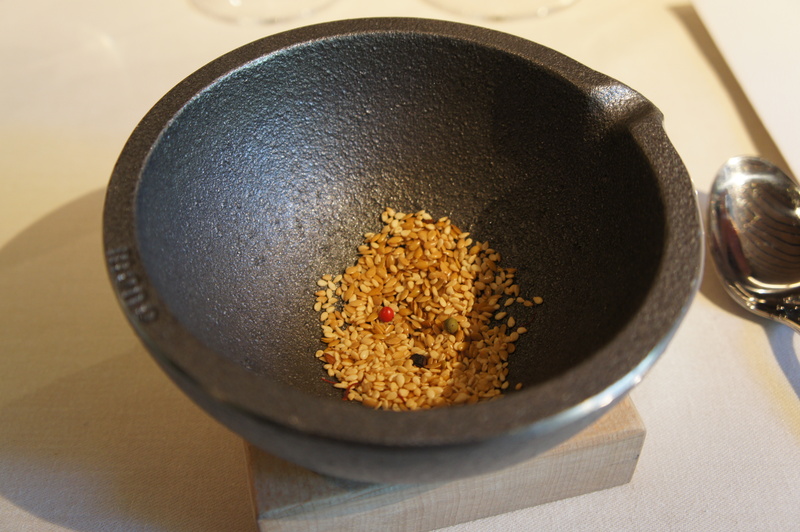 It involved us (the diners) pounding on sesame and other dried spices in a mortar and then adding a crunchy vegetable to it (turnips?) and a creamy brown sauce which was savory and piquant. 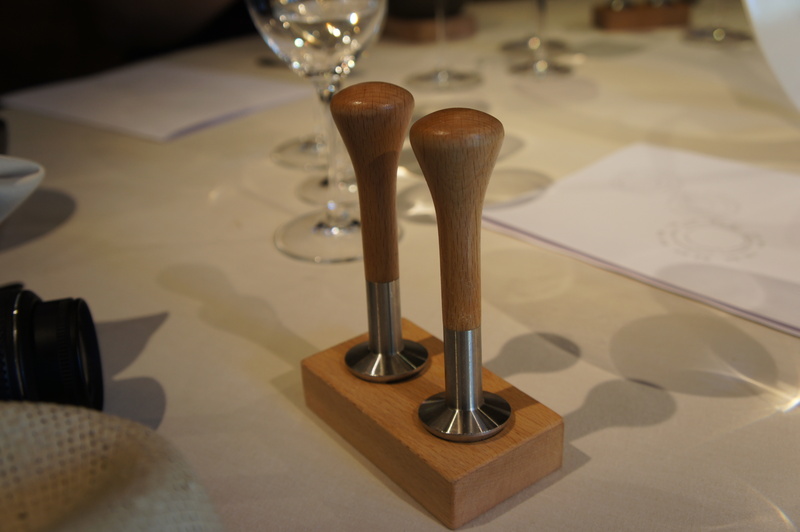 It was lots of fun grinding the spices up and making the tinkling sounds that vibrated through the restaurant! 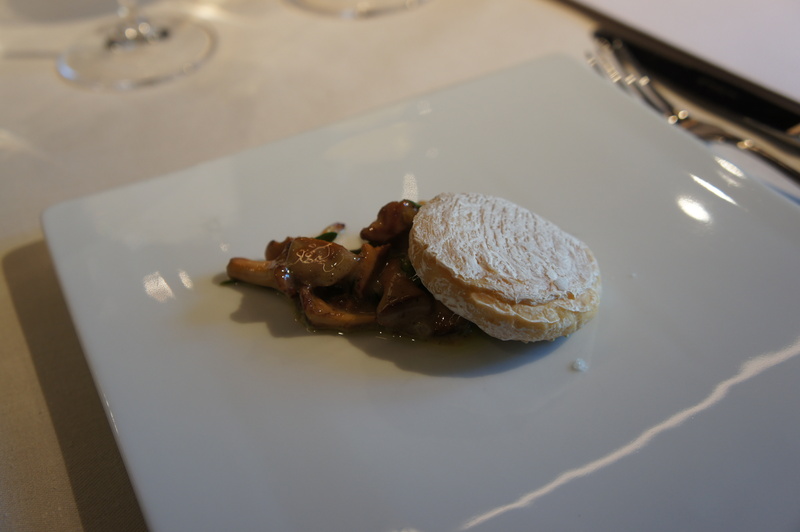 Following that fun dish, we had “portion of home-made cheese, cured in it’s own rind, mushroom and fleshy leaves “ which was like a mystery whilst we ate it because we had no idea what the cheese was made of! Tofu? Chocolate? Plastic? It tasted good, like an unwashed cheese but without the strong salty rind odours. Finally, a dish that was as described! “Hazelnut and beans stew ” was a nice humble subtle dish. 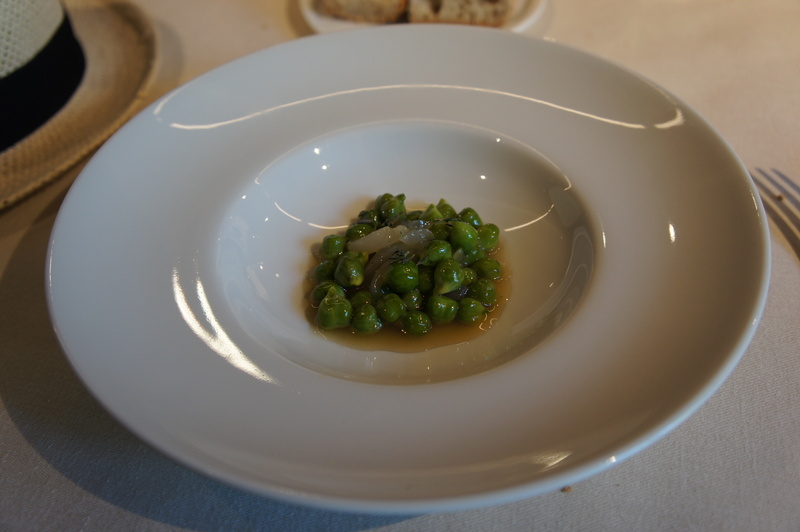 “Green cheek peas in a gelatinous stew with resinous perfume”… resinous perfume eh? 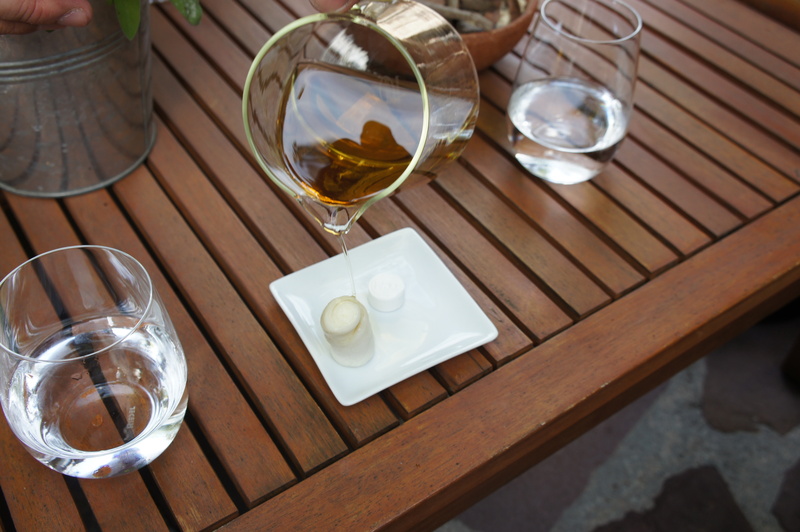 I was too afraid to ask how they made a resinous perfume… so I didn’t and just ate my dish. It was tasted good – good sturdy peas in a sauce that was like a hearty beef broth. 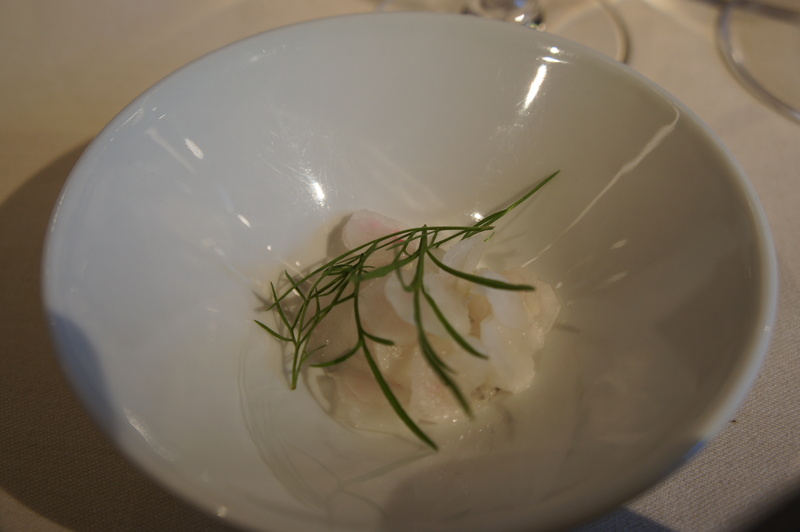 The “coastal fish with crunchy trimmings of aged sourdough and aged sweet pickled onion” was sensational! Perfectly cooked white fish with crunchy and tasty bread scattered on it. Yum! 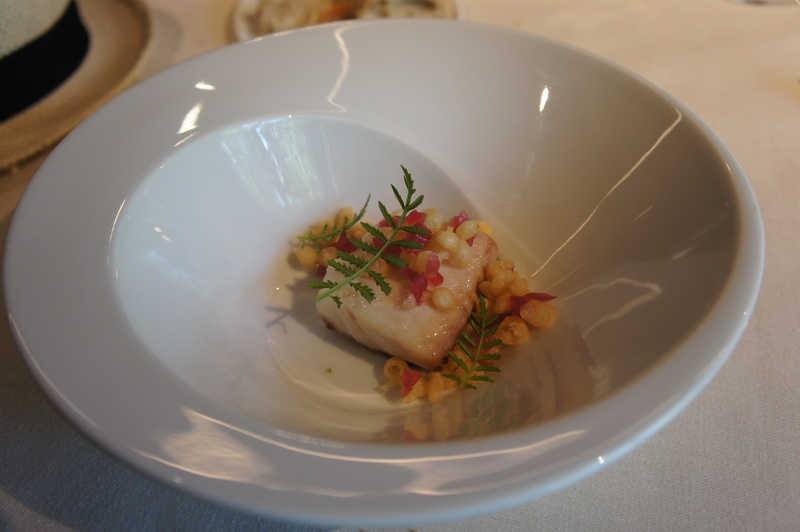 “Roasted loin of hake with clashing grains of aged marapone, cauliflower and fresh almonds “ is one of those dishes that makes you think “wow”. 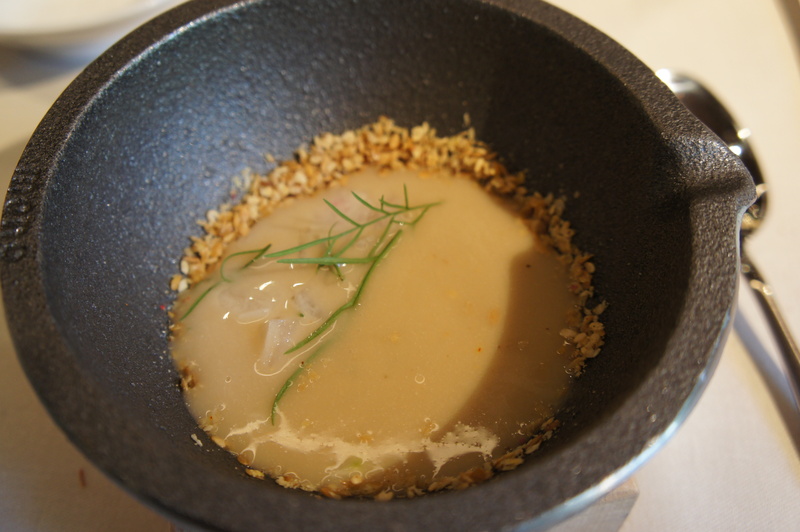 Very similar to the “marron, lychee, turnip, macadamia, celery” dish from my dinner at Loam. It’s a nice piece of well cooked fish sitting under a sprinkling of shaved veges, nuts and grains which is a dry and crunchy in texture. The texture and taste of the shavings brings the moist sweetness of the fish out. Beautiful! When I saw “crispy sweetbread with house-made capers, bitter leaves and artisan praline” on the menu, I was a bit afraid. I’m not normally one for sweetbreads. But, I suppose if I was to have it, it would be at one of the best restaurants in the world (how could they not make it taste good?!). It was delicious. Tasty seasoning, texturally it was crispy outside and firm inside (so much more bearable for me) and in a small portion! 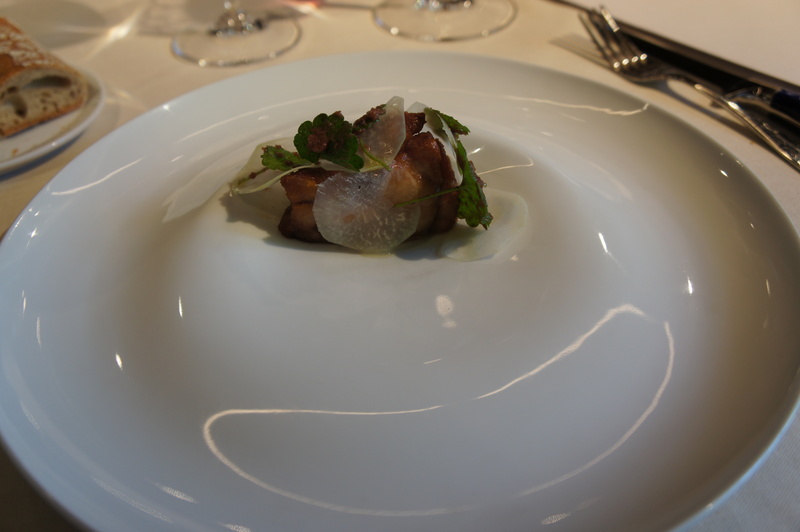 The “crunchy terrine of iberian pig tails with a bunch of bitter leaves and Txakoli sediments” was totally unexpected (in a good way!). 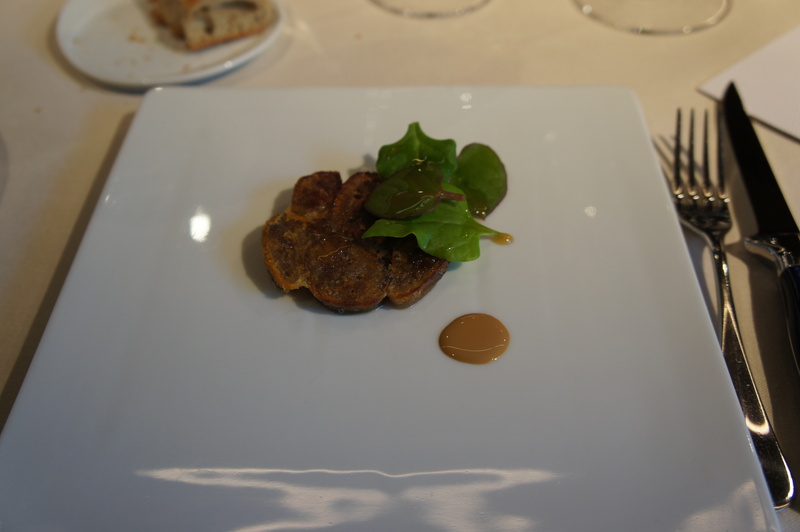 The pig tails were made into a terrine and then finely cut and either baked or fried till crispy. Tasted fantastic! 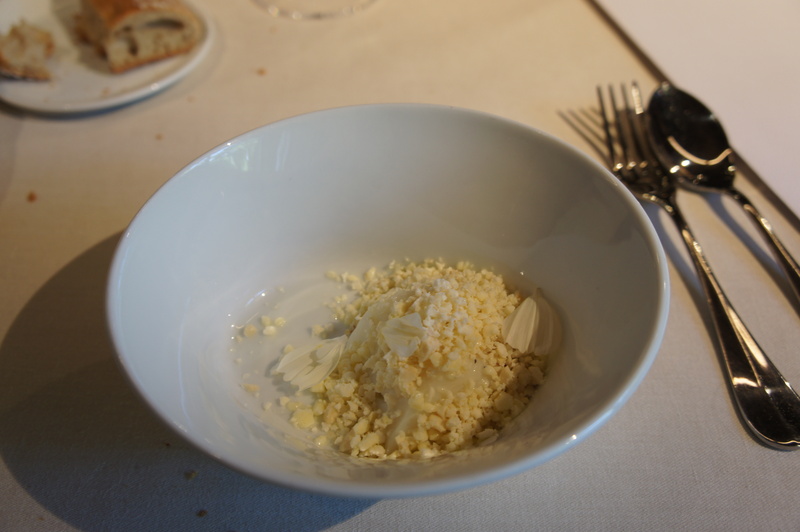 The “toasted milk and butter with cheese shavings and frozen pear cream” was divine! It was light, tasted beautiful and had great textures. So, so good! 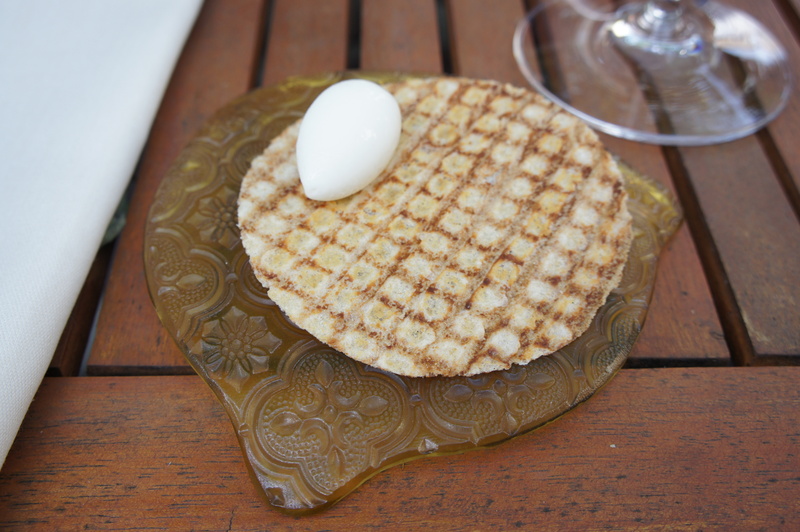 The “small bite of milky wafer with lemon ice cream” was good – sour and tangy ice cream on a sweet crispy wafer. I have no point of reference for a ““traditional” almond fairy cake” but was very sweet and lovely. It was cold, almost like a ice cream. 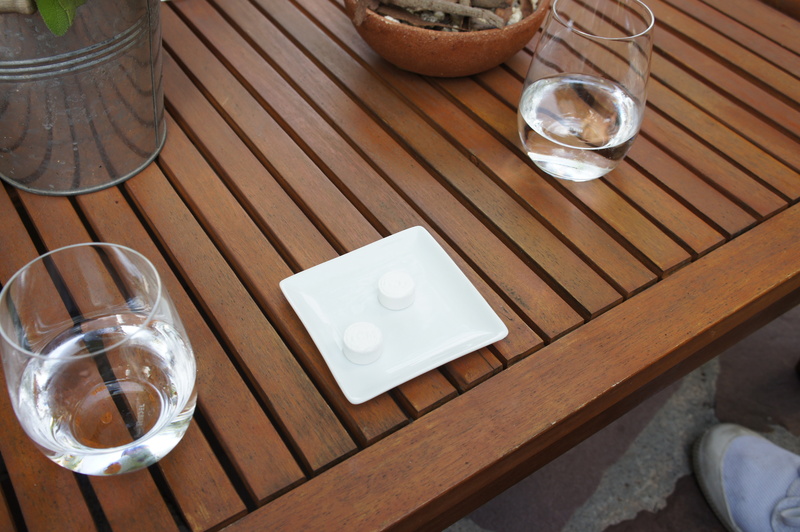 The next and final dessert, “candies of frankincense, the perfume of eucalyptus barks” was not the usual dessert. For one, it looked like a pot of burnt incense. And it smelt like bark and candy. 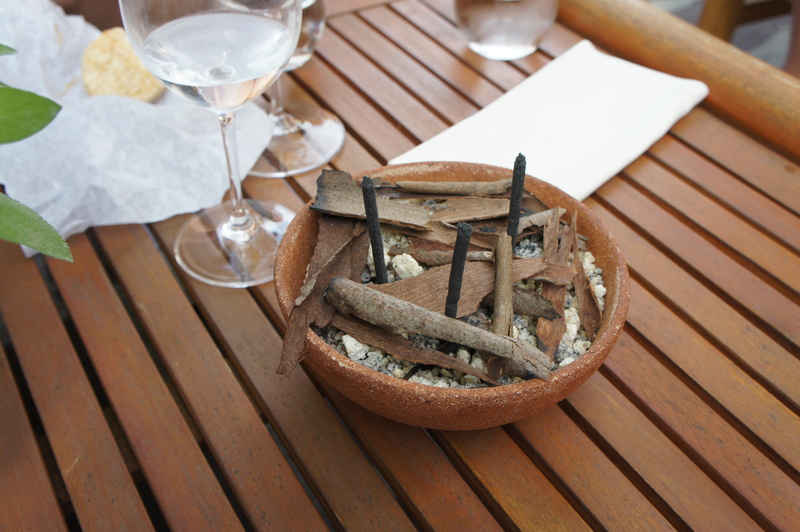 And we had to eat the sticks, which looked a bit scary, but tasted like musk sticks. Interesting to say the least. 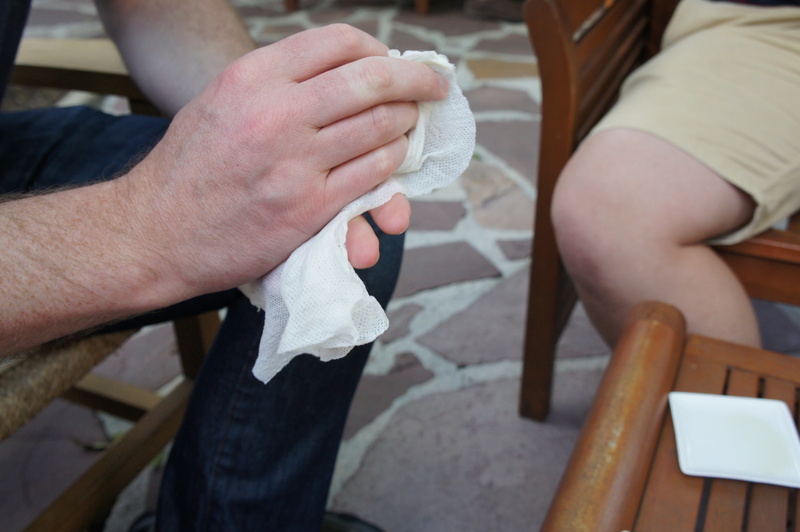 Lastly, we were given scented hand towels (no, they are not edible!). Nice way to wrap up the afternoon. In summary, I really enjoyed the experience but I think some things were over complicated. We were on holidays so I’m not sure if we fully appreciated the cerebral and intellectual aspects to the meal. It’s a beautiful restaurant that serves beautiful food, but it’s got big competition in the little tapas/pintxos places in San Sebastian itself (some of which was extraordinary). And I think we have food in Australia that equals or betters this (e.g. : Loam and Royal Mail). This looks awesome Jaime – great blog!